February is theme month once again for Revolution Rock! For more information, visit the intriguing and informative, Revrock.blogspot.ca. In 1983, Gerard Van Herk and Tony Dewald of the two piece sludegabilly duo Deja Voodoo formed the record label Og Records. This independent Canadian, Montreal, Quebec based label initially started releasing primarily cassettes, but quickly gravitated toward vinyl releases. This highly influential label would not only release material by Deja Voodoo, but also artists such as The Gruesomes, Terminal Sunglasses, and Jerry Jerry And The Sons of Rhythm Orchestra. 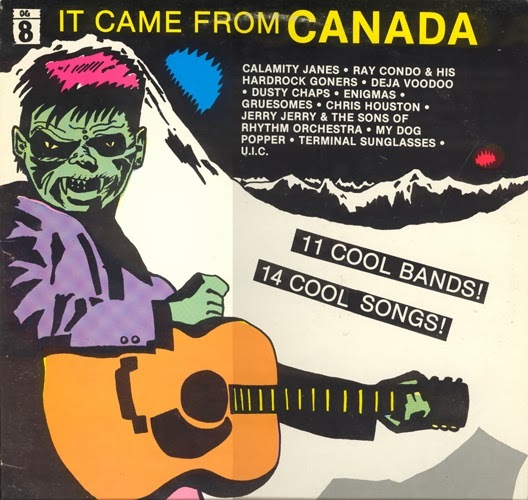 Og Records is also notable for their highly sought after compilation series It Came From Canada. There were five volumes and the compilations were responsible for exposing bands such as Shadowy Men On A Shadowy Planet and Cowboy Junkies, who would later go on to achieve more mainstream successes. Og Records only ever had 29 releases and ceased operations as a label in 1990. This program will features a selection of music from this short lived label and an exclusive interview with co-founder of Og Records and Deja Voodoo Gerard Van Herk. This entry was posted in news, Uncategorized and tagged It Came from Canada, Og Records, Revolution Rock, Special Programming. Bookmark the permalink.